Contrary to popular belief, cotton buds aren’t intended for cleaning ears. In fact, it’s one of the last things they should be used for – the NHS specifically advises against it. Ear wax does a useful job protecting against bacteria, insects and fungi. Clumsy attempts to remove it can instead lead to it building up deep in the ear canal, potentially causing hearing problems and dizziness. Particularly careless use can even perforate eardrums. Worse still, Live Science reported recently on a 31-year old British man who developed a potentially life threatening infection that spread to the lining of his brain, causing neurological symptoms, after the tip of a cotton bud got stuck inside his ear. 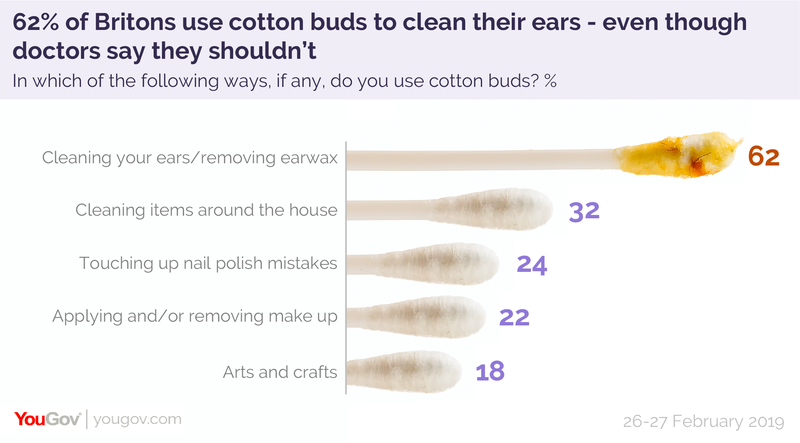 Despite such horror stories, new YouGov Omnibus data reveals that 62% of Britons are playing with fire and using cotton buds to clean their ears. In fact, 22% of Britons say that the only thing they use them for is digging out ear wax. This is especially likely to be the case for men (31%) than women (14%). Only a minority of Britons use them for the kind of things that they’re are actually supposed to be used for: one third (32%) use them for cleaning items around the house, a quarter (24%) use them for touching up nail polish mistakes, one in five use them to apply or remove make up (22%) and some are using them in arts and crafts (18%). Nevertheless, many of those who are using cotton buds for appropriate activities are also sticking them in their ears. In fact, just 12% of Britons could be said to be truly using their cotton buds correctly – i.e. who are using them exclusively for activities other than pushing them inside their head.